Contemplative prayers uses ancient Christian techniques to center on God. 12:30pm Mondays at PEACE Lutheran Church. 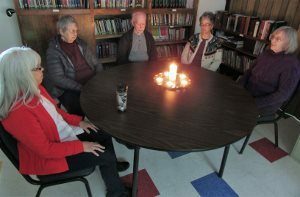 Candles are lit and voices are stilled during a session of contemplative prayer at Peace Lutheran Church in Grass Valley. Every Wednesday at 12:30 p.m., participants briefly push aside the clutter of the world to humbly seek the presence of God. The sounds that fill the ensuing silence echo the clutter of the six minds in the room. A car drives by, a stomach growls, a throat swallows, a clock ticks, another throat clears, the building’s heating system thrums, a body shifts in a chair, breath moves in and out. When the day’s to-do list pops up, the Jesus Prayer, repeated now silently, brings the mind back to the focus of this 30-minute time-out from earthly cares. That focus, the goal of this prayer, has its roots in the earliest Christian teachings: to lift the mind and the heart to God in praise and thanks, and to ask for all our material and spiritual needs. After a period that seems both an eternity and an instant, Smith Le Van’s alarm beeps quietly. “Lord, remember us when you come into your kingdom,” the minister prays, repeating the words of a criminal to Jesus as the two were crucified. The group finishes their session with the Lord’s Prayer. Contemplative prayer has been used by Christians for centuries, Smith Le Van said. With practice, it helps “gain control of our overactive brains and create stillness so the Holy Spirit can work through us and help us live the virtues in union with God,” according to the Greek Orthodox Metropolis of Atlanta, Ga. (visit www.OrothodoxPrayer.org). The Jesus Prayer is especially powerful in this discipline that creates a space for God’s spirit to speak to those who seek Him, Smith Le Van said. In that space, one can feel and accept the mercy and forgiveness God offers freely to all. “At this moment when our mind is totally concentrated on God, we discover a very personal and direct relationship with Him,” according to OrothodoxPrayer.org. And with practice, it gets easier, Smith Le Van promised. Contemplative Prayer is at 12:30 p.m. Wednesdays in the Conference Room at PEACE Lutheran Church. Come a little early and ask at the office, or call Pastor Eileen at (530) 273-9631 if you have any questions.